One Hot Stove: IMBB 16: An Eggsotic Biryani Feast! IMBB 16: An Eggsotic Biryani Feast! This month's IMBB, hosted by Viv of Seattle Bon Vivant, has a theme that is dear to my heart. Something that can be savored at every meal, starting from breakfast to the last luscious bite of dessert, and for an ovo-vegetarian like me, it is a very valuable source of nourishment indeed. It is the incredible edible egg! The number of ways in which I use eggs are truly countless, so this time I wanted to make something a little elaborate, something I do not get around to cooking very often. It is one of India's most-beloved feast dishes: a layered rice dish called biryani. Biryani is a labor of love. One does not make biryani for a quick supper. It is made at leisure, and consumed at leisure. And after a biryani meal, the proper thing to do is to flop on the sofa like a beached whale and take a nap. Cook 2 cups Basmati rice with about 4 peppercorns, 4 cloves, 2-3 cardamom pods and a cinnamon stick. Set rice aside to cool, then toss it with 1 tbsp. ghee. Drizzle the rice with 1/4 tsp saffron that has been soaked for a few minutes in 1/4 cup warm milk. Slice 2 onions. Heat oil in a saucepan and fry the onions till pink. As the onions are frying, make a thick paste of 1 bunch cilantro, 1 bunch mint and 1 tbsp. yogurt. 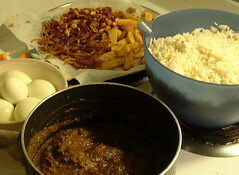 Add ginger-garlic paste, salt, turmeric, chili powder, garam masala and the herb chutney into the onions and fry well. Add 1/2 cup tomato puree, simmer for several minutes and set aside. Peel them and cut them into quarters. Layering: Grease a large pot or Dutch oven. Add layers in following order: rice, curry, eggs, garnishes. End the last layer with garnishes. Cover the Dutch oven tightly and place it on low heat till the biryani is steaming hot. The rice at the bottom may get dried out and crispy, but that only makes it tastier. Raita is the perfect accompaniment for biryani. Dice up some onions and tomatoes, add yogurt and cilanto, season with cumin and salt and toss everything together. The raita is a cool counter-point to the spiciness of the biryani. There you have it- an egg-sotic feast fit for royalty! wow nupur , the pics say it all. yoma. Wow! That looks so delicious. I don't get to eat Indian food very often, let alone vegitarian Indian food. This looks so good that I might even attempt to make this at home. Thanks for sharing! Oh yummm... absolutely YUM, Nupur! You make it sound so easy, too. Oh yum looks great. Love biryani but am yet to attempt it. Thanks for the detailed instructions and fabulous photos! That looks exotic! And I'm drooling all over rhe nice office carpet. :-) I always end up making mutton or chicken biryani as Sid is a complete carnivore. However, I shall definitely try your eggie-version soon! What a beautiful and yummy blog! That looks so good - biryanis are one of my comfort foods, believe it or not! I think it was the first thing I learned to like in Indian restaurants when I went with my parents. Now, of course, there's no stopping me, but biryanis still hold some serious sway... Thanks for the recipe! 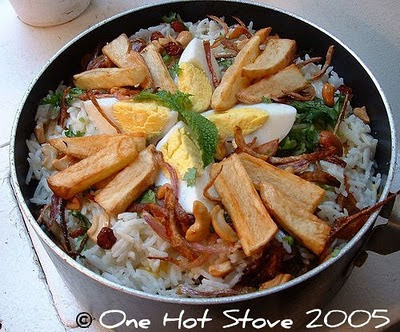 Lots of fried stuff with eggs and rice, I'm all over it. This looks very unusual, but definitely tasty. I will have to give it try soon. Thanks for the recipe. One hot stove, that look delish! Will try it soon..
Nupur, that biryani was real great. I regret I couldn't eat any more of it. But now I have a recipe! Hi Reid, its really quite an easy recipe to try at home, although I confess it is time-consuming and leaves lots of dirty dishes to wash up later! Hi Shammi, Stephen, Augustus G., Thanks for stopping by! Hi Elvira, Thanks...I'm glad you like it. I'm still a newbie blogger, still learning. Hi Melissa, Birynai is quite an exotic comfort food! Hope you get a chance to make it yourself. Hi Big lu, 30in2005...Glad you liked it! Hi L. I understand you were not quite in the biryani-eating state of mind that night :) Come over soon for another meal and make up for it! Thanks for stopping by! Nothing like rice with fried goodies and eggs, right? Glad you liked it. can you give a specific instruction on the making of the saffron rice? i have some saffron stored up in my kitchen cabinet but still don't know how to make use of them! Tried your egg biryani yesterday and it was really yummy and fragrant. Thank you for the post and the detailed instructions. Hi Nupur, tried your egg biryani last friday and it was awesome! My husband and I really enjoyed it!! Thanks again for sharing your great recipes. Also, I used the occastion to use my le creuset dutch oven for the first time! I tried this yesterday and it was wonderful. The only change I made was to add some ginger-garlic paste to the masala.. Thank you and you have a wonderful blog here.. I tried this yesterday and it was great.Thank you. Hello, I want to try this recipe but I cannot judge quantities well. Can you please tell me how much ginger, garlic, salt, turmeric, garam masala, etc; to use? Thank you very much! You could add 1/2 tsp of turmeric and chili powder and 1 tsp. of the rest. Made it today. I am a beginner in cooking, so this recipe was a little intimidating, but i this i managed it well. Next time will be beter!